The UK's leading brand of Asian cuisine has given its packaging design a bold new brand identity. 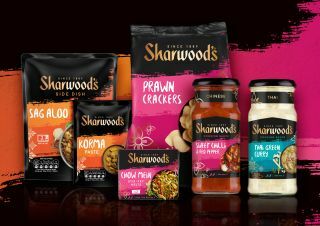 A vibrant new packaging design is on the way for Sharwood's, the UK's leading brand of Asian cuisine. Created in partnership between Premier Foods and award-winning branding consultancy Coley Porter Bell, the new packaging design aims to help consumers engage with Sharwood's, as well as developing the brand architecture to accommodate new product developments. Complete with vivid brushstrokes and product names written in a free-form font, the creative team behind the redesign hopes the new look will give a sense of adventure, modernity and impact on the shelf.